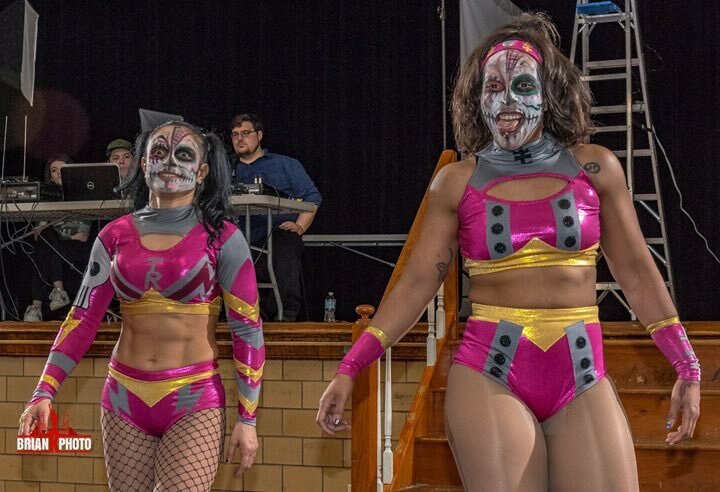 Here is the bizarre tag team, Twisted Sisters comprised of Thunder Rosa and Holidead. Besides being one half of Twisted Sisters, Thunder Rosa (Mel Cervantes) is also Kobra Moon on Lucha Underground. Holidead (Camille Ligon) is not only the other half of Twisted Sisters, but also a part of the Japanese Stardom stable Oedo Tai along with with Act Yasukawa, Kyoko Kimura, Dragonita, Heidi Lovelace, Hudson Envy, Kris Wolf, Nikki Storm, Star Fire, La Rosa Negra, Kaitlin Diemond, Viper, Diosa Atenea, Kagetsu, Leah Vaughan and Hana Kimura. That's not a Stable thats an army.